15 options available. 15 options match your criteria. Our website shows just a small selection of our extensive product range. Please call us on 01277 654233 or complete a 'Make an enquiry' form on our 'Contact Us' page if you would like to buy, order, reserve or just need more details. PRR is the extreme synthesis of Alé philosophy is the highest point in the research for the development of professional garments for completion. It features an ergonomic fit studied on the typical bike position of the professional athlete: garments designed for the pure performance. The study on fabrics super light structures and perfect breathability was obsessive. PRR made use of a constant prolonged and severe series of tests with professional athletes both men and women (even in the wind tunnel) which gave a decisive contribution to the development of minimal but very important detail. Ergonomically cut Winter jacket for a colder climate made with a triple-layer fabric and printed with a modern design. An eye-catching garment designed to keep you warm. 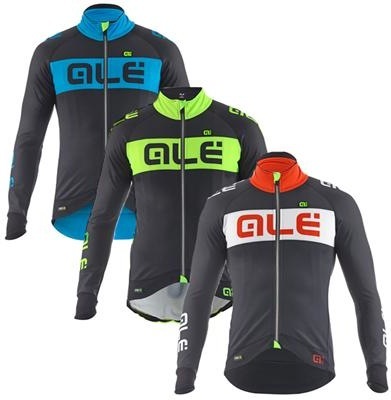 Wind stopping laminated 3L light fabric strategically positioned in the front and sleeves to protect you from the cold. Elastic system made in coupled double-layer fabric in which the internal part boasts a carbon fabric while on the outside the fabric is micro-perforated. Used for the bottom of jerseys and jackets this shaped elastic system effectively keeps the garment in position while cycling with a perfect fit. (Event let the sweat out) Waterproof ... breathable – Event DVL is a new waterproof breathable lighter and packable fabric which keeps all adverse weather conditions at bay and at the same time allows the skin to breathe and the sweat to escape! The DVL membrane is unique: it offers maximum breathability dependability and the long life span recognised with event fabrics but is certainly lighter and is specifically created for every weather adventure. Yellow Jersey Cycles Limited is a company registered in England & Wales with company number 07830092. Registered office: 102 Western Road, Billericay, CM12 9DT. VAT number: 140 1339 59. ©2019, Yellow Jersey Cycles Limited.